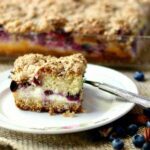 Layers of tangy cream cheese and sweet blueberry and sandwiched between a buttery cake topped with a crunchy pecan crumble. Substitute pineapple for the blueberries if you wish. Blend the flour, baking soda, and baking powder – set aside. Beat 1 cup of sugar and ½ cup butter until creamy. Stir in the sour cream, vanilla, and almond extract. Slowly beat the flour mixture into the sour cream mixture. Spoon half the dough into the pan. Beat the cream cheese, ½ cup white sugar, and egg together until smooth. Spoon over the dough in the baking dish. Drop the remaining dough by spoonfuls over the filling. Mix the topping ingredients in a bowl with your fingers until crumbly.